The best bridal shower ever? Bree Dahlhaus of Little White Couture styled this pastel bridal shower and I’m in love! Bree tells us all about it right here! Best friends, bubbly, and brunch – what more does a girl need? The best way to celebrate in your wedding lead up is with your besties, a morning brunch enjoying sweet treats and champagne! 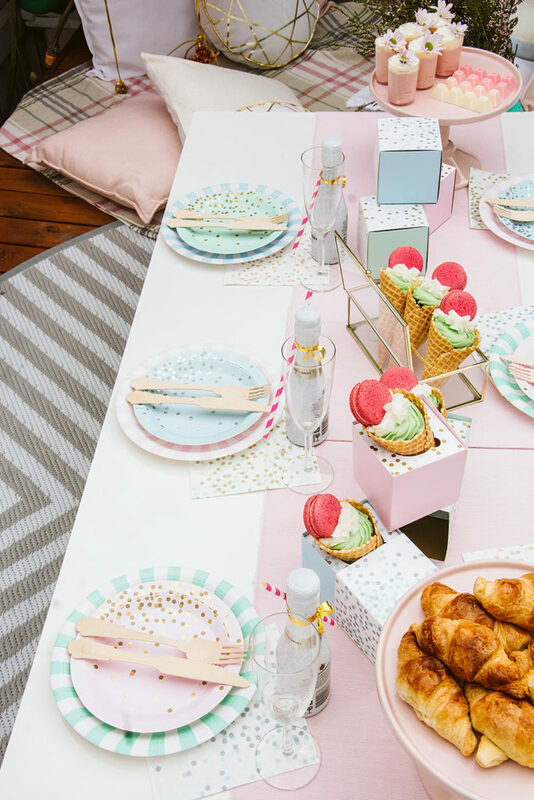 The inspiration for this party came from the mixed pastel tableware by Australian designers, Paper Eskimo, featuring a beautiful confetti design and eco-friendly wooden cutlery. For the main focus, we transformed a blank outdoor space with an incredible pastel balloon installation by Lovely Occasions. Oma and Eve whipped up some sweet treats in keeping with the pastel theme with an ombre selection of chocolates, cupcakes ice cream cones and light and creamy pastel mousse. Little White Couture completed the overall look with our range of bridal robes and PJs (because who doesn’t want to feel luxe and comfy). Matched with our leather flower crowns and floral sashes, brought the bridal shower look together and would be the perfect DIY option for brides to recreate. Wooden Gift Box – The Bridal Box Co.
Little White Couture is a boutique wedding accessory store. You can find them on Instagram and Facebook.